For figure skater Jennifer Robinson, representing her country at the Olympics is a dream come true. For Canada’s Jennifer Robinson, representing her country at the Olympics is a dream come true, but it’s a dream that took a long time to fulfill. The under appreciated skater has now medalled in nine straight Canadian championships, eight in seniors, with five golds, a silver, and two bronze medals in ladies. That’s a record never reached by Elvis Stojko, Kurt Browning, Bourne and Kraatz, or even the legendary Barbara Ann Scott. But the 2002 Olympics will be her first. She was still a junior when Canada last sent a woman to the Olympics in 1994. The country did not qualify a lady in 1998. “”I always dreamed of going to the Olympics, but I didn’t know in what. I dreamed a lot of dreams and they all came true,” Robinson stated. Jennifer actually started her sports career in gymnastics, starting out about five and taking lessons until she was eight, but a trip to the Ice Capades changed her life: “I fell in love with the whole thing — the spins, the jumps, the speed, the excitement, the crowd, everything,” bubbles Robinson. She quit gymnastics and took some ballet lessons and some skating lessons at the St. Clair Shores Figure Skating Club in Michigan. But one day, the family car was involved in a huge 45-car pile up on I-94 and Louise Robinson decided to stay closer to home. They worked with coach Lori Lafferty-Vilneff at the Riverside Figure Skating Club. When it became obvious that Robinson had national-caliber talent, her mother and father sought out new coaches and found Doug and Michelle Leigh at the Mariposa Winter Club in Barrie, Ontario. Robinson said that, “They’re like a second family. Michelle’s like my second mom, always fixing my hair and everything. I love where I am. They help me in the good times and they’re always there in the bad times.” If there is one person happier than Jennifer at the Canadians kiss and cry, it’s Michelle Leigh. Robinson says she’s a very family-oriented person and will be starting her own family this summer when she marries longtime beau Shane Dennison, a former pairs skater who now coaches figure skating. Jennifer plans to have a family but said, “I’m not going to get pregnant right away. My husband and I are both in the skating business so we can still see each other all the time even if I keep competing. I’m still young and I feel like skating for a few more years. I have a very competitive nature.” That showed when Robinson came back from second behind Annie Bellemare after the qualifying rounds and short program to win the free skate and the 2002 Canadians to secure the lone Olympic spot. Robinson’s other interests include music and reading, primarily novels and mysteries. “My musical tastes are very eclectic,” she says. “I like Canadians like Tragically Hip, Tea Party, and Sara McLachlan.” Jennifer played the alto saxophone in her school band but always wanted to play the piano and the violin: “I’m definitely going to take lessons some day.” She prefers to skate to classical music. When devising her programs, Robinson says she and choreographer Lori Nichol “play around with the music and the steps until I really feel comfortable.” This year she used a flirty number, “Street Scene”, for her short program and Franz Liszt’s classical “Liebenstraum” for her free skate, dressed in a white costume reminiscent of a wedding dress. Robinson has competed in every one of the Grand Prix events, with a personal best of third at Skate Canada in 1999. 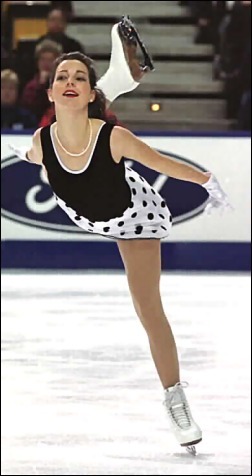 She has competed in five World Championships, finishing as high as eighth in Nice in 2000, and every Four Continents Championship, finishing ninth this year. But she said “I never come to a competition with a placing in mind. I want to do the best I can for myself and the audience. Performing brings out a different side of me. I used to be really shy.” Canadian fans would never know that. Robinson is a huge fan favorite, always cheerfully signing autographs, visiting hospitals, and publicizing the sport in Canada. Robinson has no realistic chance of winning a medal at the Olympics, but she has earned her way there. Now’s her chance to live her dream.